Accra Aug. 28, GNA - The Universal Merchant Bank (UMB) has signed a $10.8million agreement with Central Sugar Company Limited to kick-start the establishment of a factory that would process cassava into starch for export. 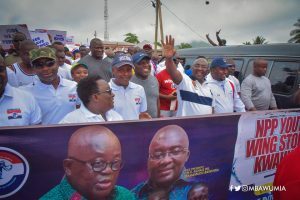 The project under the One District, One Factory (IDIF) flagship, which is to be sited in the Pru District in the Brong Ahafo Region would also undertake the processing of by-products such as biogas to fuel the factory and fertilizer for the various farms. CNBM General Technology Company Limited, a Chinese firm, is expected to put up the factory that would employ about 115 persons and 2,000 jobs for the various farms within eight months. Mr John Awuah, Managing Director of UMB and Mr William Oppong-Bio, Chairman of Central Sugar Company Limited signed for their respective organisations while; Mr Alan Kyeremanten, Minister of Trade and Industry and Mr Robert Ahomkah-Lindsay, Deputy Minister of Trade and Mr Kojo Oppong Nkrumah, Minister designate for Information signed as witnesses. Mr Kyeremanten described the signing ceremony as significant because one of the critical challenges facing the country in job creation adding that creation of jobs could only be done in different sectors of the economy. The Minister was elated that the One Factory One District (IDIF) was also being replicated in advanced countries such as India and the strategic objectives of the IDIF was to create jobs in the rural areas, stem the rural-urban migration, increase foreign exchange as a result of the creation of an export market as well as enhance skills of the people. Mr Kyeremanten noted that the IDIF was being misinterpreted pointing out that the programme was a partnership between government, the private sector, banks and the local assemblies.“We have established district implementation teams and right at the district level government is playing its role,” he added. The Minister commended the UMB for being the fore-runners of the IDIF adding that the bank had exhibited bold courage by taking up the challenge to partner firms under the IDIF and reiterated that under the IDIF machines or equipment, importation of some raw materials would enjoy duty free and firms would also enjoy tax holidays for five years. He reaffirmed government’s commitment to support to ensure the success of these projects. Mr Awuah noted that the signing ceremony was in fulfilment of the bank’s pledge made to the Presidency to support the IDIF. The Managing Director of UMB said while some banks had set up desk for the IDIF, UMB had gone further to establish UMB Private Public Partnership Incubator Centre to handle the government’s flagship programme and had so far received over 100 projects as part of the country’s industrialisation programme, and 22 of the project transactions were being considered for approval. Mr Oppong-Bio commended UMB Board for backing their “words with action saying industrialisation had been part of him and took the opportunity to add value to products such as cassava. Mr Young Pan, who represented CNBM General Technology Company Limited said when the factory was completed, it would process 200 tonnes of cassava daily and people would be trained to take over the various skills.